Well here are the new shoes I bought yesterday-they were from Debenhams (a high street department store) and they are by J for Jasper Conran. They were in the sale-originally £65, reduced to £19!!! I really liked them as I did want court style shoes plus they have a high wedge heel, so they are ideal for a day look too!! Today Chris and I went to the boot sale-again!! 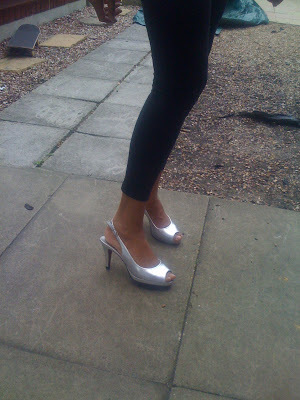 I got these silver New Look shoes for £1-very CL, as they have a red sole!! I also got a lovely white summer dress-at last, also by New look for only £2!!! I will wear and post a picture in this when we get a blazing hot day-hopefully, soon-haha!! wow, can't believe those jasper conrans were £19! amazing. Hi Elle-yes, a good bargain, thanks!! wow i love the first shoes! please - explain - what does kooky mean? Those are both great. I really love wedges. Good prices as always! Hi fashionpuppy!! So sorry to confuse you-I take it to mean edgy, unusual and different, in a good way!! 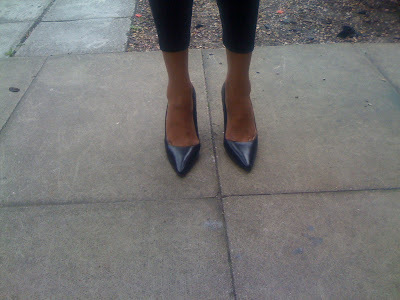 Hi Wendy-thanks so much-I feel more stable in wedges plus I wanted a court style, so a double whammy really!! oooh, lovely shoes! hope you get that hot day soon! the second shoes are great! Hi karima-I'm hoping this week will be HOT!!! Hi mademoiselle bariolee-thank you and thanks for stopping by too!! Oh my gosh, you find the best deal. Love the black wedge. The first pair is so hot! J's are rocking! Love your choices! wow you have nice shoes, so cute! I really love the silver pair because they stand out so well! Hi vain and vapid-haha, just lucky I suppose!! Hi Acielle-thanks a lot, so kind!! Hi jen-thanks a lot, I'm sure they will come in handy one day!! Shoe shopping is so much fun! The deals you got are amazing. CL-inspired shoes with the red sole are becoming more popular. I see them a lot more often in places such as Ross. Fantastic finds as always, Sharon, dearest. Both pairs are amazing! I am so jealous!! You always manage to find such good stuffs. Hi angel-so kind, thanks a lot my dear! Hi christina-thanks a lot-yes, I was quite pleased to see the red soles-haha!! Hi ida-thanks so much, my dearest!! Hi yiqin-thanks, more lucky I think-haha!! Hi b-thanks, glad you like them! I adore the silver pair :). Hi times of glory-I may be bargain queen, but you are most certainly designer queen-I covet your wardrobe-haha!! Hi alicepleasance-thanks, my thoughts exactly!! Hi fashion chalet-haha, yes shoe reporting duty duly done for Sunday!! You're most welcome, my dear!! Love both your new shoes, perfect! Hi Silje-always so lovely, thanks my dearest!! What great buys. Lovely shoes, both pair but I really like the wedges. Fantabulous! 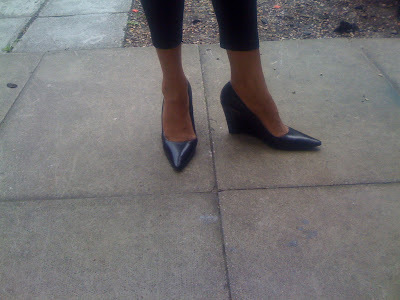 Hi Cheryl Lynn-thanks so much, I hope the black wedges are a good buy! !